In computing, a Digital Object Identifier or DOI is a persistent identifier or handle used to identify objects uniquely, standardized by the International Organization for Standardization (ISO). An implementation of the Handle System,   DOIs are in wide use mainly to identify academic, professional, and government information, such as journal articles, research reports and data sets, and official publications though they also have been used to identify other types of information resources, such as commercial videos. A persistent identifier is a long-lasting reference to a document, file, web page, or other object. In computer programming, a handle is an abstract reference to a resource. Handles are used when application software references blocks of memory or objects managed by another system, such as a database or an operating system. A resource handle can be an opaque identifier, in which case it is often an integer number, or it can be a pointer that allows access to further information. The International Organization for Standardization is an international standard-setting body composed of representatives from various national standards organizations. A Uniform Resource Locator (URL), colloquially termed a web address, is a reference to a web resource that specifies its location on a computer network and a mechanism for retrieving it. A URL is a specific type of Uniform Resource Identifier (URI), although many people use the two terms interchangeably. Thus http://www.example.com is a URL, while www.example.com is not.</ref> URLs occur most commonly to reference web pages (http), but are also used for file transfer (ftp), email (mailto), database access (JDBC), and many other applications. indecs was a project partly funded by the European Community Info 2000 initiative and by several organisations representing the music, rights, text publishing, authors, library and other sectors in 1998-2000, which has since been used in a number of metadata activities. A final report and related documents were published; the indecs Metadata Framework document is a concise summary. The DOI for a document remains fixed over the lifetime of the document, whereas its location and other metadata may change. Referring to an online document by its DOI is supposed to provide a more stable link than simply using its URL. But every time a URL changes, the publisher has to update the metadata for the DOI to link to the new URL. It is the publisher's responsibility to update the DOI database. If they fail to do so, the DOI resolves to a dead link leaving the DOI useless. Link rot is the process by which hyperlinks on individual websites or the Internet in general tend to point to web pages, servers or other resources that have become permanently unavailable. There is no reliable data on how long web pages and other resources survive: the estimates vary dramatically between different studies, as well as between different sets of links on which these studies are based. The developer and administrator of the DOI system is the International DOI Foundation (IDF), which introduced it in 2000. Organizations that meet the contractual obligations of the DOI system and are willing to pay to become a member of the system can assign DOIs. The DOI system is implemented through a federation of registration agencies coordinated by the IDF. By late April 2011 more than 50 million DOI names had been assigned by some 4,000 organizations,  and by April 2013 this number had grown to 85 million DOI names assigned through 9,500 organizations. Unicode is a computing industry standard for the consistent encoding, representation, and handling of text expressed in most of the world's writing systems. The standard is maintained by the Unicode Consortium, and as of March 2019 the most recent version, Unicode 12.0, contains a repertoire of 137,993 characters covering 150 modern and historic scripts, as well as multiple symbol sets and emoji. The character repertoire of the Unicode Standard is synchronized with ISO/IEC 10646, and both are code-for-code identical. For example, in the DOI name 10.1000/182, the prefix is 10.1000 and the suffix is 182. The "10." part of the prefix distinguishes the handle as part of the DOI namespace, as opposed to some other Handle System namespace, [upper-alpha 1] and the characters 1000 in the prefix identify the registrant; in this case the registrant is the International DOI Foundation itself. 182 is the suffix, or item ID, identifying a single object (in this case, the latest version of the DOI Handbook). DOI names can identify creative works (such as texts, images, audio or video items, and software) in both electronic and physical forms, performances, and abstract works  such as licenses, parties to a transaction, etc. Another approach, which avoids typing or cutting-and-pasting into a resolver is to include the DOI in a document as a URL which uses the resolver as an HTTP proxy, such as https://doi.org/ (preferred)  or http://dx.doi.org/, both of which support HTTPS. For example, the DOI 10.1000/182 can be included in a reference or hyperlink as https://doi.org/10.1000/182 . This approach allows users to click on the DOI as a normal hyperlink. Indeed, as previously mentioned, this is how CrossRef recommends that DOIs always be represented (preferring HTTPS over HTTP), so that if they are cut-and-pasted into other documents, emails, etc., they will be actionable. An alternative to HTTP proxies is to use one of a number of add-ons and plug-ins for browsers, thereby avoiding the conversion of the DOIs to URLs,  which depend on domain names and may be subject to change, while still allowing the DOI to be treated as a normal hyperlink. For example. the CNRI Handle Extension for Firefox [ permanent dead link ], enables the browser to access Handle System handles or DOIs like hdl:4263537/4000 or doi:10.1000/1 directly in the Firefox browser, using the native Handle System protocol. This plug-in can also replace references to web-to-handle proxy servers with native resolution. A disadvantage of this approach for publishers is that, at least at present, most users will be encountering the DOIs in a browser, mail reader, or other software which does not have one of these plug-ins installed. The International DOI Foundation (IDF), a non-profit organisation created in 1998, is the governance body of the DOI system. It safeguards all intellectual property rights relating to the DOI system, manages common operational features, and supports the development and promotion of the DOI system. The IDF ensures that any improvements made to the DOI system (including creation, maintenance, registration, resolution and policymaking of DOI names) are available to any DOI registrant. It also prevents third parties from imposing additional licensing requirements beyond those of the IDF on users of the DOI system. ↑ Other registries are identified by other strings at the start of the prefix. Handle names that begin with "100." are also in use, as for example in the following citation: Hammond, Joseph L., Jr.; Brown, James E.; Liu, Shyan-Shiang S. (May 1975). "Development of a Transmission Error Model and an Error Control Model l". Technical Report RADC-TR-75-138. Rome Air Development Center. Bibcode:1975STIN...7615344H. hdl:100.2/ADA013939. A Uniform Resource Identifier (URI) is a string of characters that unambiguously identifies a particular resource. To guarantee uniformity, all URIs follow a predefined set of syntax rules, but also maintain extensibility through a separately defined hierarchical naming scheme. A Uniform Resource Name (URN) is a Uniform Resource Identifier (URI) that uses the urn scheme. The Uniform Domain-Name Dispute-Resolution Policy (UDRP) is a process established by the Internet Corporation for Assigned Names and Numbers (ICANN) for the resolution of disputes regarding the registration of internet domain names. The UDRP currently applies to all generic top level domains, some country code top-level domains, and some older top level domains in specific circumstances. A persistent uniform resource locator (PURL) is a uniform resource locator (URL) that is used to redirect to the location of the requested web resource. PURLs redirect HTTP clients using HTTP status codes. Life Science Identifiers are a way to name and locate pieces of information on the web. Essentially, an LSID is a unique identifier for some data, and the LSID protocol specifies a standard way to locate the data. They are a little like DOIs used by many publishers. 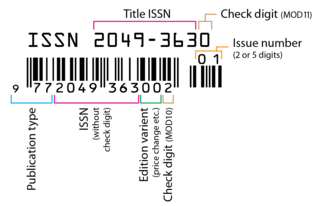 The Serial Item and Contribution Identifier (SICI) is a code used to uniquely identify specific volumes, articles or other identifiable parts of a serial. It is "intended primarily for use by those members of the bibliographic community involved in the use or management of serial titles and their contributions". Crossref is an official Digital Object Identifier (DOI) Registration Agency of the International DOI Foundation. It is run by the Publishers International Linking Association Inc. (PILA) and was launched in early 2000 as a cooperative effort among publishers to enable persistent cross-publisher citation linking in online academic journals. The International Geo Sample Number or IGSN is a sample identification code of typically nine characters. As an active persistent identifier it can be resolved through the Handle System. The system is used in production by the System for Earth Sample Registration (SESAR), Geoscience Australia, Commonwealth Scientific and Industrial Research Organisation Mineral Resources, Australian Research Data Commons (ARDC), University of Bremen MARUM, and German Research Centre for Geosciences (GFZ). Other organisations are preparing the introduction of the IGSN. A Formal Public Identifier (FPI) is a short piece of specially formatted text that may be used to uniquely identify a product, specification or document. One of their most common uses is as part of document type definitions, but they are also used in the vCard and iCalendar formats to identify the software product that has generated data. The Handle System is the Corporation for National Research Initiatives's proprietary registry assigning persistent identifiers, or handles, to information resources, and for resolving "those handles into the information necessary to locate, access, and otherwise make use of the resources". An Archival Resource Key (ARK) is a Uniform Resource Locator (URL) that is a multi-purpose persistent identifier for information objects of any type. An ARK contains the label ark: after the URL's hostname, which sets the expectation that, when submitted to a web browser, the URL terminated by '?' returns a brief metadata record, and the URL terminated by '??' returns metadata that includes a commitment statement from the current service provider. The ARK and its inflections provide access to three facets of a provider's ability to provide persistence. The ORCIDiD is a nonproprietary alphanumeric code to uniquely identify scientific and other academic authors and contributors. This addresses the problem that a particular author's contributions to the scientific literature or publications in the humanities can be hard to recognize as most personal names are not unique, they can change, have cultural differences in name order, contain inconsistent use of first-name abbreviations and employ different writing systems. It provides a persistent identity for humans, similar to that created for content-related entities on digital networks by digital object identifiers (DOIs). An Extensible Resource Identifier is a scheme and resolution protocol for abstract identifiers compatible with Uniform Resource Identifiers and Internationalized Resource Identifiers, developed by the XRI Technical Committee at OASIS. The goal of XRI was a standard syntax and discovery format for abstract, structured identifiers that are domain-, location-, application-, and transport-independent, so they can be shared across any number of domains, directories, and interaction protocols. lex is a URN namespace, a type of Uniform Resource Name (URN), that allows accurate identification of laws and other legal norms. The MIRIAM Registry, a by-product of the MIRIAM Guidelines, is a database of namespaces and associated information that is used in the creation of uniform resource identifiers. It contains the set of community-approved namespaces for databases and resources serving, primarily, the biological sciences domain. These shared namespaces, when combined with 'data collection' identifiers, can be used to create globally unique identifiers for knowledge held in data repositories. For more information on the use of URIs to annotate models, see the specification of SBML Level 2 Version 2. 1 2 "ISO 26324:2012(en), Information and documentation — Digital object identifier system". ISO . Retrieved 2016-04-20. ↑ Witten, Ian H.; David Bainbridge & David M. Nichols (2010). How to Build a Digital Library (2nd ed.). Amsterdam; Boston: Morgan Kaufmann. pp. 352–253. ISBN 978-0-12-374857-7. ↑ Langston, Marc; Tyler, James (2004). "Linking to journal articles in an online teaching environment: The persistent link, DOI, and OpenURL". The Internet and Higher Education. 7 (1): 51–58. doi:10.1016/j.iheduc.2003.11.004. ↑ "How the 'Digital Object Identifier' works". BusinessWeek. BusinessWeek. 23 July 2001. Retrieved 20 April 2010. Assuming the publishers do their job of maintaining the databases, these centralized references, unlike current web links, should never become outdated or broken. 1 2 Davidson, Lloyd A.; Douglas, Kimberly (December 1998). "Digital Object Identifiers: Promise and problems for scholarly publishing". Journal of Electronic Publishing. 4 (2). doi:10.3998/3336451.0004.203. ↑ "Welcome to the DOI System". Doi.org. 28 June 2010. Retrieved 7 August 2010. ↑ "DOI® News, April 2011: 1. DOI System exceeds 50 million assigned identifiers". Doi.org. 20 April 2011. Retrieved 3 July 2011. ↑ "doi info & guidelines". CrossRef.org. Publishers International Linking Association, Inc. 2013. Archived from the original on 2002-10-21. Retrieved 10 June 2016. All DOI prefixes begin with "10" to distinguish the DOI from other implementations of the Handle System followed by a four-digit number or string (the prefix can be longer if necessary). ↑ "DOI Handbook—2 Numbering". doi.org. International DOI Foundation. February 1, 2016. Retrieved 10 June 2016. The registrant code may be further divided into sub-elements for administrative convenience if desired. Each sub-element of the registrant code shall be preceded by a full stop. ↑ "Frequently asked questions about the DOI system: 6. What can a DOI name be assigned to?". International DOI Foundation. 3 July 2018 [update of earlier version]. Retrieved 19 July 2018. ↑ "DOI Handbook – Numbering". doi.org. 13 February 2014. Section 2.6.1 Screen and print presentation. Archived from the original on 30 June 2014. Retrieved 30 June 2014. ↑ "New Crossref DOI display guidelines are on the way". ↑ Powell, Andy (June 1998). "Resolving DOI Based URNs Using Squid: An Experimental System at UKOLN". D-Lib Magazine. ISSN 1082-9873. ↑ ChrissieCW. "Crossref Revises DOI Display Guidelines - Crossref". www.crossref.org. ↑ Green, T. (2009). "We Need Publishing Standards for Datasets and Data Tables". Research Information. doi:10.1787/603233448430. ↑ "multilingual European DOI Registration Agency". mEDRA.org. 2003. ↑ John R. Levine (2015). "Assigning Digital Object Identifiers to RFCs § DOIs for RFCs". IAB. doi:10.17487/rfc7669. RFC 7669 . ↑ Lewoniewski, Włodzimierz; Węcel, Krzysztof; Abramowicz, Witold (2017-09-23). "Analysis of References Across Wikipedia Languages". Communications in Computer and Information Science. 756: 561–573. doi:10.1007/978-3-319-67642-5_47 . Retrieved 2018-05-06. ↑ Timmer, John (6 March 2010). "DOIs and their discontents". Ars Technica . Retrieved 5 March 2013. ↑ DeRisi, Susanne; Kennison, Rebecca; Twyman, Nick (2003). "Editorial: The what and whys of DOIs". PLoS Biology . 1 (2): e57. doi:10.1371/journal.pbio.0000057. PMC 261894 . PMID 14624257. ↑ Franklin, Jack (2003). "Open access to scientific and technical information: the state of the art". In Grüttemeier, Herbert; Mahon, Barry. Open access to scientific and technical information: state of the art and future trends. IOS Press. p. 74. ISBN 978-1-58603-377-4. ↑ "DOI System and Internet Identifier Specifications". Doi.org. 18 May 2010. Retrieved 7 August 2010. ↑ "DOI System and standard identifier registries". Doi.org. Retrieved 7 August 2010. ↑ International DOI Foundation (2014-08-07). "Resolution". DOI Handbook. Retrieved 19 March 2015. 1 2 "DOAI". CAPSH (Committee for the Accessibility of Publications in Sciences and Humanities). Retrieved 6 August 2016. ↑ Schonfeld, Roger C. (2016-03-03). "Co-opting 'Official' Channels through Infrastructures for Openness". The Scholarly Kitchen. Retrieved 2016-10-17. 1 2 Piwowar, Heather (2016-10-25). "Introducing oaDOI: resolve a DOI straight to OA" . Retrieved 2017-03-17. ↑ "Chapter 7: The International DOI Foundation". DOI Handbook. Doi.org. Retrieved 8 July 2015. ↑ "DONA Foundation Multi-Primary Administrators". Archived from the original on 14 January 2017. Retrieved 7 February 2017. ↑ "Digital object identifier (DOI) becomes an ISO standard". iso.org. 10 May 2012. Retrieved 10 May 2012. ↑ "about_the_doi.html DOI Standards and Specifications". Doi.org. 28 June 2010. Retrieved 7 August 2010. ↑ "Overviews & Standards – Standards and Specifications: 1. ISO TC46/SC9 Standards". Doi.org. 18 November 2010. Retrieved 3 July 2011. ↑ "About "info" URIs – Frequently Asked Questions". Info-uri.info. Retrieved 7 August 2010. ↑ "ANSI/NISO Z39.84-2000 Syntax for the Digital Object Identifier". Techstreet.com. Retrieved 7 August 2010. ↑ International DOI Foundation (2012).